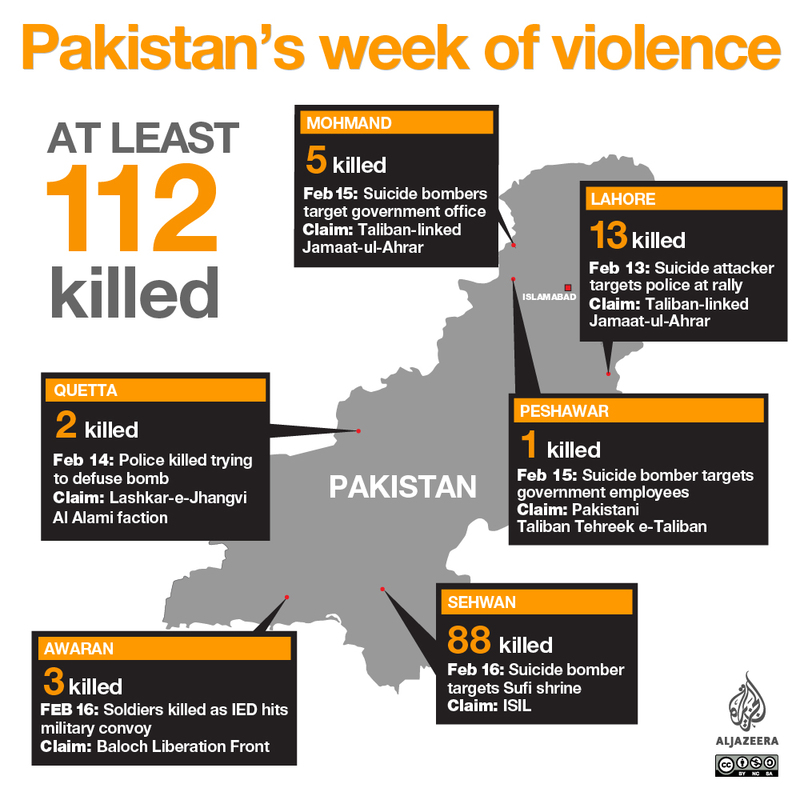 Pundita: After a week of terror incidents, will Pakistan's military face reality? After a week of terror incidents, will Pakistan's military face reality? In the wake of yesterday's suicide bombing in Sindh at one of the most important Sufi shrines in South Asia, which at last count has killed 88 including children and injured 200, Pakistan's military sprang into executive action. Within the past 24 hours the military has killed 100 terrorists in the country according to their announced count and rounded up many more, although one military source told Associated Press earlier that the number of killed was 39. As to how they managed such fast work, well obviously they knew where to look. This reminds me of the parable of the man who searched outside for the keys he lost in his house because the light was better outside. It doesn't help anybody to fixate on ... Afghanistan as being the only problem that we face. [While there are groups that use Afghan safe havens] the core problem Pakistan faces today is inside Pakistan. The network of terrorists exists in this country and the solution is also inside Pakistan. That's from Mosharraf Zaidi, former security advisor to Pakistan's Foreign Ministry and columnist for Pakistan's News National Daily, who was interviewed today by Al Jazeera TV. However, the AJ anchor's first question to Zaidi was about Islamic State's presence in Pakistan. Zaidi replied in part that the terror group has had a much larger presence in Pakistan than the military has been willing to acknowledge up to this point. See the link below for the video of interview; you might have to reload the page to bring up the video. But now, with IS claiming responsibility for the Sufi shrine bombing, the Pakistani military has no choice but to acknowledge that the IS attacks in Pakistan have not been isolated incidents. And yet it is the homegrown terror groups operating openly in Pakistan for decades who pose the largest threat to the country. The question is whether the military's rampage over the past 24 hours is a sign of a changed attitude toward the groups, or just a cosmetic fix. The bottom line is this: the local terror groups have charitable organizations attached to them, which provide important services that the local and central governments in Pakistan are too cheap to provide. The second big factor is the same one that plagues Saudi Arabia: there are large numbers of hardline clerics in Pakistan who are pampered by the government so they won't foment rebellion, and who provide justification for the terror groups. * Now as to whether the Torkham Gate crossing is used by U.S./NATO forces to truck supplies into Afghanistan, as far as I know, yes. It would be interesting to learn whether Pakistan did indeed shut down a second border crossing, and if so whether that one is Chaman Gate, which is the other crossing used for bringing U.S. supplies into Afghanistan. If both crossings are shut, well, we'd have to see for how long. Military's claim follows deadliest attack in more than two years in country, targeting Sufis in Sehwan Sharif in Sindh. Pakistan's army has killed more than 100 "terrorists" in less than 24 hours following a suicide blast at a Sufi shrine, the deadliest attack in the country in more than two years. The killings, announced by the military's media office, come amid calls for more security in the country following a string of recent attacks. In a statement released on Friday, the military said: "Over 100 terrorists have been killed since last night and sizeable apprehensions also made." A day earlier, at least 88 people were killed and hundreds were injured when a suicide attacker targeted Sufis as they performed a devotional ritual at the famous Lal Shahbaz Qalandar shrine in Sehwan, a town in the southern Sindh province. "Army is for security," the military statement said. "We shall not let the hostile agenda succeed whatever it may cost." The Islamic State of Iraq and the Levant (ISIL, also known as ISIS) claimed responsibility for Thursday's attack in Sehwan. Earlier, Prime Minister Nawaz Sharif said in a statement: "It is time for us to unite and fight the radicals, wherever they may be ... I direct and authorise my armed forces and law enforcement agencies to eliminate the enemy." Following the attack, Pakistan closed two border crossings with Afghanistan. Pakistan has repeatedly blamed Afghanistan for giving safe haven to fighters on its side of the border. Mosharraf Zaidi, former adviser to Pakistan's Foreign Ministry, told Al Jazeera: "It doesn't help anybody to fixate on the problem of Afghanistan as being the only problem that we face." While there are groups that use Afghan safe havens, the "core of problem Pakistan faces today is inside Pakistan", he added. Thursday's attack came after one of the bloodiest weeks in recent memory in Pakistan, with more than 100 people killed in a series of attacks since Monday, the majority of which were claimed by the Pakistani Taliban or one of its factions. On Monday, 13 people were killed in a suicide bombing at a rally in the eastern city of Lahore.